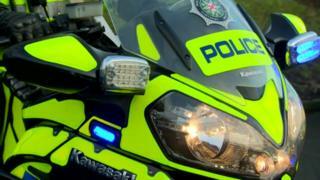 A Belfast man has died after a one-vehicle crash in County Antrim. Jim McGranaghan, who was 52, died after the vehicle he was travelling in crashed near Nutt's Corner on Friday. The crash happened at the junction of Ballyutoag Road and Ballyutoag Hill shortly before 05:30 GMT. Two other men who were in the vehicle were taken to hospital. Police are appealing for anyone who witnessed the crash to contact them.